Red Box Engineering were selected as the Metal Work partner for a heating project in West Quay shopping mall, Southampton. 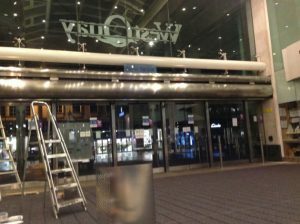 The brief involved designing stainless steel cladding around the Diffusion Chameleon Air Curtain heaters, which were chosen to replace the existing heaters running along the entrance to the shopping centre. We firstly needed to look at the existing structure, and how to integrate the heaters into this. We created a plan, concept and design with a whole new look. The challenge was to work around existing steel posts along the entrance, and keeping to the style and profile of West Quay. We worked with the Diffusion group to take the standard chameleon heaters and customise them; making them smaller so as to fit in with the design. Using SolidWorks 3D software, we designed a complete computer model, and built all the panels accordingly. We also redesigned all the bracketing and framework for the cladding. Once on site, we stripped out the existing heaters, stripped out the cladding in sections and put up the new, customised chameleons, as well as the two dummy chameleons on each end to keep up with the aesthetics. The whole project being such a success, Red Box Engineering have now been asked to look at replacing the locks and hinge fixings on the service panels in the shopping centre.